Menifee Internal Medicine - Dr. David Stanford M.D. What is Internal Medicine ? Internal Medicine is the branch and specialty of medicine concerning the diagnosis and nonsurgical treatment of diseases in adults, especially of internal organs. While the name "internal medicine" may lead one to believe that internists only treat "internal" problems, this is not the case. Doctors of internal medicine treat the whole person, not just internal organs. We are here to care for you no matter how simple or complex your illness may be. 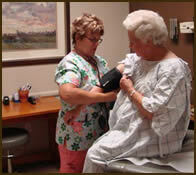 Our caring and educated staff and physicians have in-depth understanding of all health and prevention issues.